Stand Up For Local Charities. Get your weekend off to the perfect start and enjoy a side splitting night of comedy this Friday. 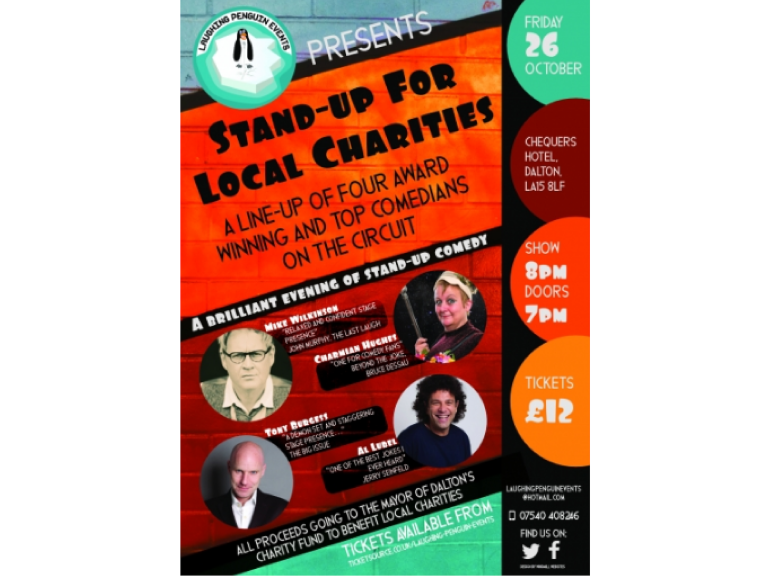 Laughing Penguin Events (the people behind Barrow Comedy Club - The Duke of Comedy and The Comedy Mill - Ulverston) are proud to announce that the next Stand-up For Local Charities comedy night takes place on Friday 26th October at Chequers Hotel, Dalton. There’s a fantastic night of comedy to look forward to with four top headlining and hilarious comedians from the circuit providing the laughs and all proceeds from the evening will be going to the Mayor of Dalton's charity fund to benefit local charities. A professional comic for over 10 years, Mike has supported such comedy greats as Peter Kay, Johnny Vegas, Ross Noble and Jason Manford. Al Lubel trained as a lawyer, but after passing his bar exam launched his parallel career as a stand-up. Eventually he quit law, and within a year he won $100,000 on the TV talent show Star Search. He became one of the last comics to appear on The Tonight Show with Johnny Carson, and has been on with his successor Jay Leno several times, too, including the recurring character of NBC Legal Analyst. Doors open at 7pm with the show starting at 8pm. Following the comedy there will be live music from the amazing and brilliant Fiona Music in the Lakes. So what’re you waiting for? Get your tickets booked, help support local charities and prepare yourselves for the best Friday night you’ve had in a long time. What’s Happening In Barrow and Furness this weekend? Easter Treats at Apollo Bingo this Bank Holiday Weekend.